Last weekend was my first time outside this year. It felt good to be back out again with Solihull Mountaineering Club. The weather and company were great. It always takes me a few climbs to get back into it after a winter of climbing inside. On this trip I was able to help my friend Anthony do his first lead climb outside. I top roped two HVS’s and lead climbed a V Diff. The video above is a pink bouldering problem with me being sight guided by Anthony. Good to be back doing proper training after a finger injury that took much longer than expected to get better. At the time of writing there are 4 international competitions planned for this year, 1 in Austria. 1 in France & 2 in the U.K. I hope to be going to all 4. But before these there will be training days and hopefully more trips outside. Sept14th-18th saw the World Championships take place in Bercy, Paris. 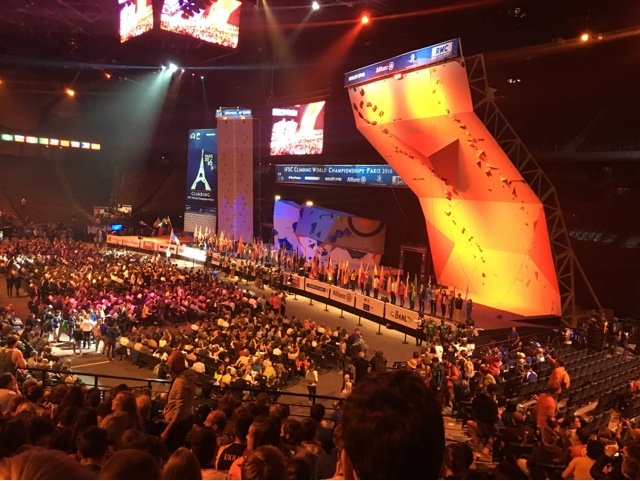 The World Championships are held every two years, The finals of all three disciplines sport, bouldering and lead would be held in the Accord Hotel Arena, Bercy, Paris. This was also the venue for the Paraclimbing qualifiers and Finals. Preparation for this World Championship had gone well, at the last one I had picked up an injury 12 weeks before the championships, which you can imagine was not good news. This time I was feeling much stronger. this time round the format was slightly different with the two qualifiers being held on two separate days and the Final being on the third day (depending on which category you were in, there was one Final on Saturday and another on Sunday). This time I had decided before I got to the competition that I was going to enjoy it, and not let nerves get the better of me and all in all this plan worked. Before I got to the competition I knew that I would not have my usual sight guide and therefore would have to rely on the new team manager, who I had not climbed with before, and he had not sight guided me before in a competition. I guess this makes me more apprehensive than actually being in front of a large crowd. Things were going okay. I got kitted up and started warm-up. I then proceeded to put on the radio mic that I use for communication with whoever is calling for me. This is when I first started to notice that I was having a lot of interference with it I thought nothing of it as this has happened before, and thought it would be okay. When we are out in the arena because the caller would be in a direct line of sight there would be nothing in the way to interfere with the signal? How wrong could I have been. Prior to this we had been over the moves quite a few times so that I could try and remember particular points that would be important later on. Then disaster struck from my point of view, no sooner had I gone no more than 2 m off the ground and the radio mic cut out. I have a little bit of sight so if I am looking directly at the hold and it is no more than say a meter away I may be able to locate it. I decided that the best course of action was not thinking about messing with the radio but to just climb! I should also point out that the holds were not the best colour for providing colour contrast, as they were yellow on a pale background, not ideal for visually impaired climbers. Who knows what they were thinking when they set the route. At certain points Robin (sight guide) was telling me to go one way and I went the opposite. I guess it must’ve looked quite comical from the ground with Robin shouting as loud as he could and me shouting down to him ‘I can’t hear you’. Considering all of that, the route went quite well. I did not get to the top, but at the end of the day there were five of us within three points of each other. Day two was the second qualifier. I had the same issues with the radio, so this time we tried using mobile phones which worked better. The only thing that didn’t go better was my climbing. I’m not really sure what happened, but I didn’t get up as far on this route. But I had made it through to the Final, which was to take place on the following day. Finals day came and I was feeling pretty good about it. We also used the mobile phone technique for communication. I was much more pleased with how I climbed on this route, and just had to see how well the other competitors did. In the end there was no podium place for me, as I came fourth. I always get such a buzz out of representing my country. With the competition out of the way I could now enjoy the rest of the World Championships. A film I did for Guide Dogs. A short film of me climbing in the Peak District last month. Promoting Paraclimbing and the work of Guide Dogs. 2) to help me monitor my physical activity levels. Suffice to say I have done more of the latter. I have been learning to use the watch blind (if you pardon the pun) without looking at any instructions on the Internet. I chose to do it this way because I wanted to see how accessible it was to a blind user. I pretty much use the ‘workout app’ which is native to the watch to monitor my physical activity levels. So far I have tried a couple of other apps but some of them are not fully compatible with voice-over and others want to share too much information with everyone else (you may be able to turn this feature off but I suspect you would have to use your iPhone). I find that this is a great little app, and you select which workout you want whether it be outdoor or indoor walk, indoor or outdoor cycle, elliptical or even other. For me as an athlete this is great especially since I can use voice-over. I choose the activity I want then scroll through the pages and press ‘start’ and away I go. The three main activities that I am using it for at the moment are elliptical, indoor cycle and outdoor cycling. The latter being on a tandem which I am very grateful to have been loaned from a charity called ‘Charlotte’s Tandems’. Without this I would not be able to experience outdoor cycling as I am far too dangerous on a mountain bike by myself. The benefit of the applewatch talking is that whilst I am doing an activity (so long as I am in a quiet environment) I just touch the screen, find the page I want, and I can get the information about how well I am doing, e.g. this could be how many calories I have burned, my heart rate or the distance I have gone. I also use the ‘activity app’. Some of the benefits of the activity app are that you can change your ‘daily move goal’, which is how many calories you want to burn in one day. You can also set it to tell you to move every hour. Another brilliant little feature of the activity app is that it will tell you how much activity you achieved in the previous week. I find this a great little feature as I can monitor how much exercise I have done and make sure that I increase it for the coming week. The other sport that takes up a lot of my time is climbing, so far I have been unable to find an app that is specific to climbing, e.g. in that it measures the height that you have climbed up and down the wall, and how long you spend on each route. The other thing that I would be worried about is banging the watch on the wall and holds indoors, or on the rock face, if I used it outside. I know the watch has strong glass but i’m not sure it would survive a direct hit, but I guess I could wear a large wristband with something sturdier covering the face to protect it. I have also had a little play around with the clock faces on the watch. I am currently using the modular face, which I find is perfect for what I need, to give me the option to put specific information on the clock face so as I turn my wrist the information is there (saving me having to go into the apps or using glances). As I mentioned in a previous blog the watch uses a simplified version of what you would find on the iPhone. Having now used it for a few more weeks I find that it is very useful. I think also that other members of my family like it because I do not constantly have voiceover on my phone announcing that I have a new Twitter or Facebook message. I also use several other apps on the watch, and found that some work better than others with voiceover. As time goes on I will explore more apps and use the ones that work best for me. But, all in all, I am very happy with the Apple Watch. In the past all I had was a talking watch which obviously told me the time and had a stopwatch but that was it. If you had told me a few years ago that I would be able to use a watch the same as a sighted person I would not have believed you especially one that has all the features that the Apple Watch has. A blog i did for The Molly Watt Trust. Hi I am John Churcher and I have Usher syndrome type 2. I have always had a hearing loss and was diagnosed with retinitis pigmentosa at the age of 14, was then registered partially sighted in 1992 at aged 19 and registered blind in 2000. Currently, I have about 50% hearing loss and 3% vision. My two main passions are climbing and technology (even more so when it is accessible tech). I had looked at the applewatch before, but being on a limited budget and not sure what it could offer me I left it at that. Therefore I was so pleased to hear that I had been selected to receive an #applewatch from the Molly Watt Trust. I eagerly awaited its arrival but as always with these things they seem to arrive when you’re out. Once I got it home I then proceeded to do the set up. The first few steps proved to be a bit tricky. I’m usually pretty good with gadgets but this time I got a bit stuck, but with the help of somebody who can see I was soon up and running. 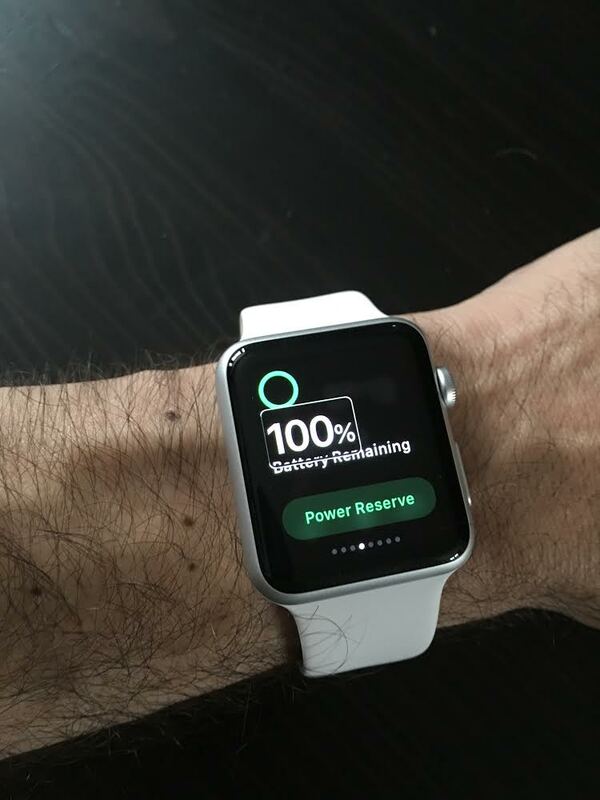 Photo shows Applewatch with text highlighted using voiceover. The first thing you need to do is select the language and then pair it with your iPhone using your phone’s camera (also this step for me required assistance). I did try to activate voiceover before I started the set up but could not get it to work, maybe I did not press the Crown quick enough or this feature is not available at this stage of set up. As far as I can make out these are the only steps that you would need help with if you cannot see the screen. From this point on everything can be configured from your iPhone. I have had my #applewatch nearly a week now and I am really pleased with it. At first it takes a bit of getting used to as the voiceover gestures are slightly different to that of an iPad, iPhone or iPod. The other main difference is that the apps are a simplified version of what you would find on an iPhone or iPad. The more I use my watch I’m finding that as a ‘voiceover user’ the commands that you have at your fingertips are the ones that you need, so there is less time spent searching for the correct buttons to press. The initial things that I will be using the watch for are to keep track of my physical activities, and to use it for navigation when out and about with my Guide Dog Annie. This is one of the features that I am most looking forward to using as I will be notified by haptics when I need to turn, rather than having to hold my phone in my hand. Another really great feature that I like is the fact that I can use Apple Pay to pay for things. So, again instead of having to get my phone out at a contactless PayPoint I can just use my watch, which makes me feel even more safe and secure. So, now I don’t need to use a gorilla grip hold when holding my phone to pay for things as it stays safely in my pocket. So the next thing that I need to do is to set it to navigate to a place that I know well and just get used to the haptics. I am also looking forward to seeing what else I can do and use voiceover with. The only slight downside at the moment is not with the watch but with my hearing aids in that they do not connect directly to the watch therefore if I’m in a noisy environment it is harder to hear what is being said. But aside from that I think that it is great that Apple include accessibility software as standard in their products thus enabling me, having a disability, to access the same technology as everybody else. So over the coming weeks and months I will explore the Watch’s features in more detail. It would be great if you could support the Molly Watt Trust by donating to their www.globalgiving.org/projects/deafblind-need-access-to-life-enhancing-technology/page. In doing so this would help raise vital funds so that more people can have access to assisted technology to enhance their life. After a long break of 18 months I finally made it back outside. It was so great to be back on real rock. 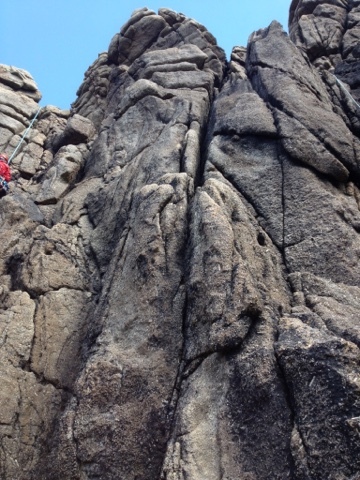 I had gone on a club meet down to Cornwall where we climbed at Sennen. This is a great place for me to climb as the access is very easy. We walked along the coast path then over a small patch of boulders and then you are at the top of the cliff. We set up the belays and then abseiled in. The weather was good. It was a bit blowy on top of the crag, but once we had abseiled down to sealevel we were out of the wind and the sun was shining brightly. We subsequently proceeded with the first climb which was Civvy route, a HS. Then we moved on to Demo route, which was also a HS. I hope that the good weather continues and I can get more climbs done outside this year. An update to the last post. 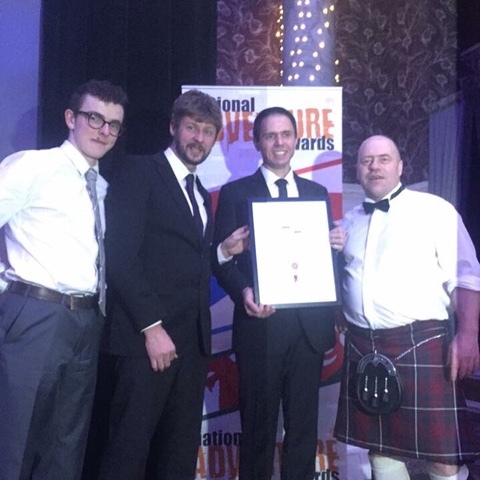 The Eigerparaclimb were the proud winners of a National Adventure Award, in Scotland, on the 16th March. We would like to say thanks to all those people who supported us. Well, it’s been a few months since I did my last blog. I wasn’t sure what to write, and I’m still not sure now, so this will be a blog about climbing and other things. After doing the Eiger last year things started to get back to normal. 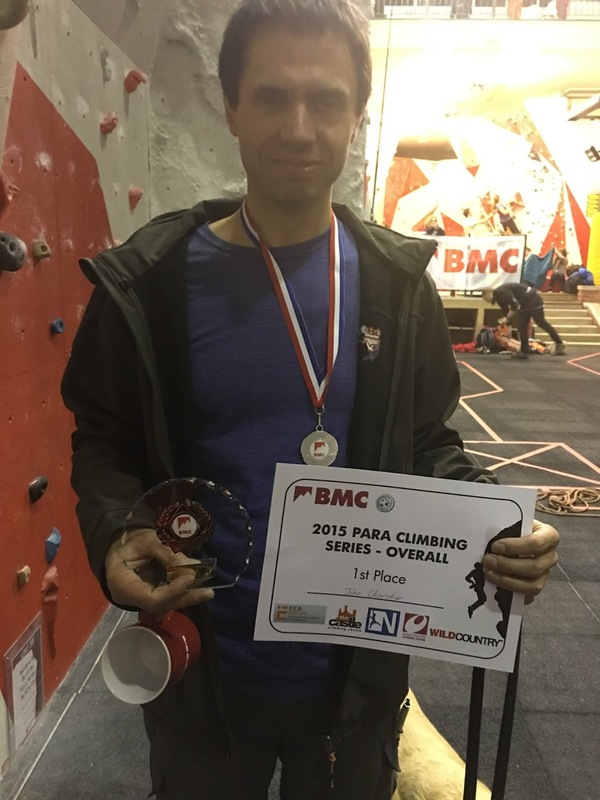 I did the national paraclimbing competition series, and I became British male VI champion. Then after Christmas me and Mark decided on a new project but then about a month later we decided that we were doing it for the wrong reasons. But, before that there will be lots of other things going on. Me and Mark, along with our friends Colin and Ian, have decided on a new project. This will be called ‘Project Shibboleth’. Shibboleth is one of Scotland’s most iconic routes on a wall called ‘slime wall’ in Glencoe. No exact date has been set for this yet, but it will be later in the summer this year. I will also be organising another Paraclimbing competition in the West Midlands for later this year. This next bit has nothing to do with climbing. Well, as a blind person you have certain perceptions about things, and recently a couple of things were pointed out to me that I could not believe. The first of which my daughter gladly told me is that white chocolate is not actually white in colour, not that I eat chocolate as an athlete! So for over 40 years I thought white chocolate was white, wow you could’ve floored me. The second was when the audio description on the TV told me that the yellow ambulance came past. When I could see, when I was younger, ambulances were white and I thought that they were still white, so when I look at an ambulance now my brain is telling me that it is yellow but all I can see is white. I still have my guide dog Annie who turned nine in February, she is working just as good as the day I had her. She still helps me get to the local bouldering wall unless she decided it’s too wet(or is that me). As I write this blog the @eigerparaclimb Team has been nominated for some awards in the National Adventure Awards, which take place in March in Scotland. I will post an update as soon as I hear anything. As I write this blog the weather outside is slowly getting warmer but it’s still just a bit too cold for trad climbing. 2015 Wow, what a year! Well it’s that time of year again when we all look back at what we achieved. I can honestly say that if you told me what I would do, I would have not have believed you. It all started in January, Jake from climbout.co.uk announced his climbout #365 challenges. Just for fun, you would set yourself as many challenges as you liked and try and do them in 2015. One of mine was to climb a mountain. It was at this point my sight guide, & now good friend, Mark McGowan said ‘do you want to climb the Eiger?’ Well what could I say but YES. Now this was my chance to prove that people with disabilities are just as capable of having adventure, with the right support. So the training began. In an earlier post I did a very detailed write up of our first training day on Tryfan, where we climbed North Ridge. We planned the climb for July 2015, so we had a good 6 months to plan & train. While all this was going on I was still training and competing in International competitions. First up was Imst. then Chamonix which was just one week before we set of to Switzerland. We travelled to Switzerland on 18th July. We did our recce on the 20th . After this the rest of the time was spent waiting for the right weather. We were looking for a 3/4 day window. The best we got came on sat 25th. The climb took the planned 3 days, 2 nights. After the Eiger came the last IFSC comp held in Sheffield, also the National Paraclimbing Series had started with the first being in Scotland, where I came first. Here’s a short clip of boulder problem 3. The last competition of the series was in Manchester at the beginning of December in which the series winners would be announced . I am very pleased to say that I am now British male V.I champion and have been reselected for the 2016 GB Paraclimbing team. So that brings us to the end of 2015 and time to start planning for 2016. After doing the Eiger back in July things slowly got back to normal.Training for the paraclimbing series began with the first competition being in scotland in September. Jump forward to November and two comps later, so far i have won each round with the final one in Manchester at the begining of December. While all this was going on me and Mark were trying to work out what our next project could be. I also gave my first talk about how i got into climbing and the story of our journey to the Eiger all in preparation for me talking at the BMC’s Disability symposium at the end of November at the Calvert trust in the Lake district.